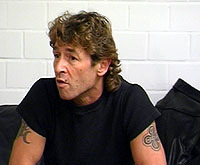 Peter Maffay's guitar auctioned March 27, 2000 at WWW.ANDSOLD.DE! Original price for the MUSIMA, Model: Nashville, with case: 12,000 DM (about 6,000 USD) Naturally, the guitar is signed by Peter Maffay. <"blink"> The entire new Maffay album "X" broadcast on the web before the official release. Date "X Saturday". March 25. "Set your dial to" BM G Backpage.de 3:00 p.m. and 11:00 p.m. sharp! On Monday, March 27, the long awaited new album will be available for purchase in the stores. Excerpt from ZDF Wettendass interview with Peter Maffay about the making of Begegnungen. ZDF, Online: For this project you were, for the first time after 26 years, again in your birth city, Kronstadt in Rumania. With which feelings did you travel there? Peter Maffay: With mixed feelings. I had anxiety about meeting certain legal requirements again which prevailed in Romania, when I left, and had to do with the communist regime at that time: the authority thinking, the fear, for moving freely on the road. I had feared that humans are not yet so free to form opinions and express these. But I was pleasantly surprised, because they did a lot. Above all the young people do not let themselves be forbidden their future any longer. Particularly in the townscape much changed - in former times one saw only very rarely laughing humans on the road, everything was grey. Now, it is no longer like that. Still.the country did not recover for a long time, but there are signs, for a fact, that people are developing initiative and accomplishing something substantial. ZDF, Online:With George Angelescu you took up a Romanian folk song. Did you have still other special connections to the Romanian culture or did you only have to rediscover these ? Peter Maffay: It was still in me already I believe, because I had to do it - if also not so intensively - 14 years long with this music, when I lived in Romania. The influences from that time work probably until today, otherwise we would probably not have come to the idea to interpret such a song. It is to this day the only musical statement, which refers to my country of origin. "Most interesting to me are, the people, who have something against foreigners "
ZDF, Online You have of spoken of the fact that you also want to foster, with your project, more tolerance and understanding of the cultures. How is one, in your opinion, to deal with right-wing extremist offenders, with whom this cannot be achieved from appeals to tolerance? Peter Maffay: A punishment, which is not assumed, whose sense one does not understand, produces no turn for another attitude or other insights. Therefore I hold with punishments only if someone something to cause pain or sets fire to the dwelling of another. Then a punishment is inevitable. Otherwise, I find it much more meaningful to explain. Parents, pedagogues and also the state would have to do much more, in the families one would have to speak, for example, more often about the third realm and about the crimes, which were committed there. This way one would help many young people, who are thereby, to form an opinion. I Regard that as a better beginning than punishing. One can sustain many punishments and still so continue as before. The people, who have something against foreigners, against another religion, skin colour or conviction, interest me. I would most like to convince these people. Second Channel of German Television-on-line: On the album there is a foreword of the Dalai Lama, the national and religious head of the Tibetians. How did the contact come off? Peter Maffay: I became acquainted with the Dalai Lama with a meeting in Berlin. There there is an institution named "Peace University", which is dedicated to the propagation of peaceful ideas. The Dalai Lama is engaged there. I believe that he is one of the few, unquestionably, who can say something about coexistence and respectful treatment. Second Channel of German Television-on-line: You experimented with different musical forms, before " meetings " for example with the children's musical " Tabaluga and Lilli ". Are there artistic dreams, which you still want to fulfill? Peter Maffay: Three years ago, if someone had asked this question, I surely would not have answered, " I would like to implement" 'meetings'". By that I want to say : It can be quite likely that someone gets a great idea next week, and we know all that that will be the next work. In music very much is feasible, it gives innumerable possibilities. Some of it I want to try out.